Opera is a web browser and Internet suite developed by Opera Software. The browser handles common Internet-related tasks such as displaying web sites, sending and receiving e-mail messages, managing contacts, chatting on IRC, downloading files via BitTorrent, and reading web feeds. Opera is offered free of charge for personal computers and mobile phones. With the latest versions, there have been serious improvements to the support offered for modern web technologies such as CSS 3. Version 12.13 is a freeware program which does not have restrictions and it's free so it doesn't cost anything. For security reasons, you should also check out the Opera Browser download at LO4D.com which includes virus and malware tests. Additional screenshots of this application download may be available, too. 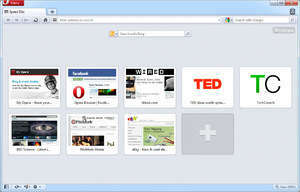 Opera Browser has a presence on social networks.